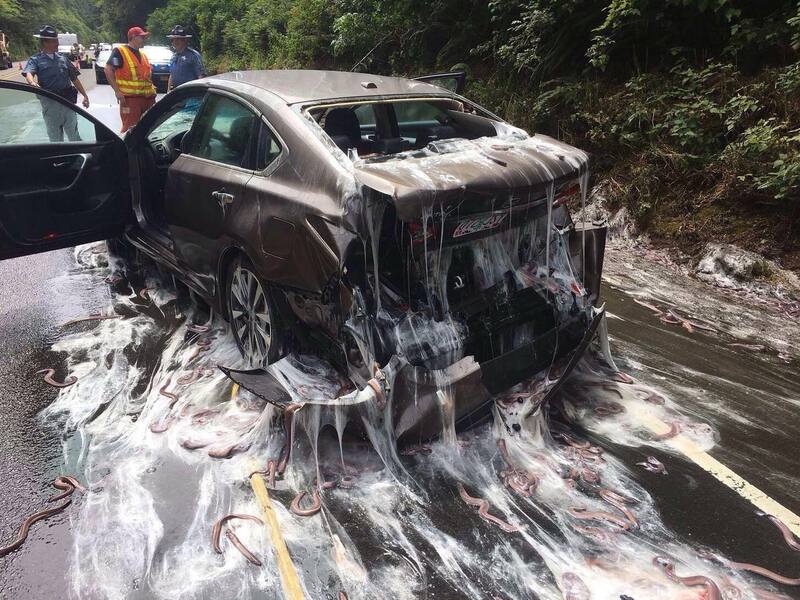 (BY SF GATE) Slippery "snot snakes" created quite a mess for the Oregon State Police on Thursday after a truck carrying a batch of slime eels was overturned near milepost 131 on Highway 101, on the Oregon Coast due west of Salem. Known scientifically as hagfish and even more colloquially as “snot snakes,” the fish are not exactly the stunners of the sea. But they play an important role in the ocean’s ecosystem by burrowing into the carcasses of dead and dying sea creatures and eating them, thus keeping the oceans clean. The snot snakes were being shipped to Korea “for consumption,” according to police. Hagfish are, apparently, prized as a delicacy, even considered an aphrodisiac (probably by blocking out what they look like and focusing on what they taste like). Their hides are also used to create wallets. All in all, they’re pretty valuable little buggers, which is why there’s been a fairly robust industry of capturing them off the Oregon coast (since 1988) and shipping them to Korea. The biggest problem is that, when captured, they secrete the microfibrous slime for which they’re known, which can expand into up to more than five gallons of the material when combined with water, and fisherman have to make sure they don’t suffocate themselves.